For this project, my group and I went and looked back into our city of conflict, Raqqa, Iraq , to evaluate what was left. I designed a combination of a farmer’s market space with a restaurant as well as a grocery store. By combining all of these into one location, it allows for more job opportunities and a sense of community. These are examples of my initial ideas when first given the project. I wanted to create a space to where there was opportunity for people to be able to be more independent financially . I also tried to create a sense of community through the design by making many, normally separate buildings, into one. This slideshow hows how I took my 3 favorite ideas and pushed them a little bit further and added more detail into them from my sketches. This slideshow includes photos of my sketchup models. I spent most of my time on this program because it allowed me to play around with my idea and show all the detail that I had wanted to. The project i designed for was one to design different aspects of a refugee camp. What I chose to design was the landscaping around the school. I wanted to be able to create a space where not only the school but the whole community could use as well. ​These sketches show my initial design for the landscaping around the school for the refugee camp. The first photo was my overall layout of the site including how I wanted community gardens, a soccer field, trails and even trees in there.My second photo shows my drawing for the canopy design I want to include into the design as well, this being for provided shade in the heat. 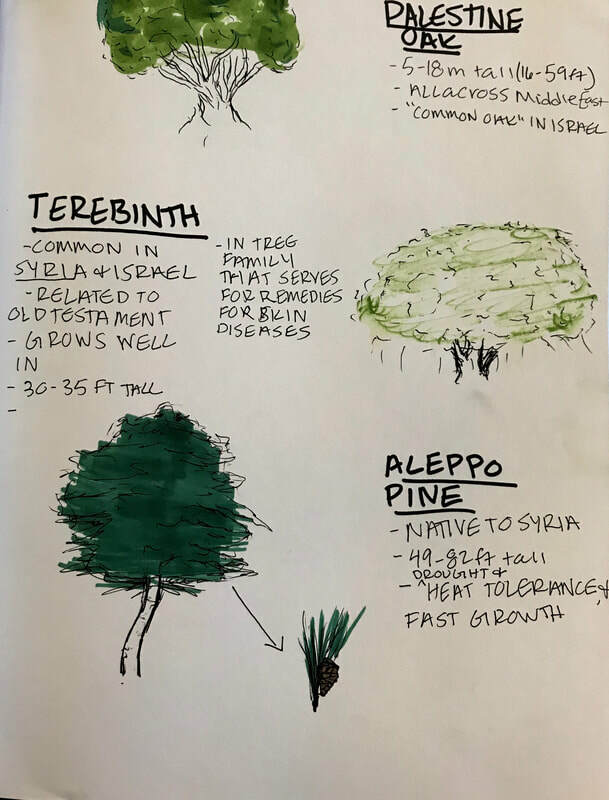 ​To further my research on the site, I looked up trees native to the area (Syria) and determined which ones would be most suitable to include onto the plan. My final models were made in Auto-CAD. The first photo in the slide shows the site by itself, there were few changes made to the site from my initial design due to a change within the school's design. The second has the plan as to where the canopies are going to be placed throughout the site. The final photo is the two combined. I based this model on my CAD drawings and included 3 variations of trees within it. I used my knowledge from my preliminary work as to what trees to use in it. In the top center of my final model there is a structure that's going to be used over the general eating area.